Ever since the Taliban took control of most of Afghanistan in 1996, the group has imposed its harsh version of Islamic law on the country. In "Beneath the Veil," journalist Saira Shah traveled to Afghanistan to see the effects of the Taliban's rule on her father's homeland. 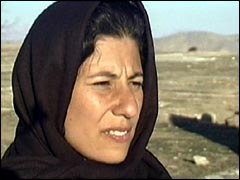 She discovered public executions, allegations of human rights violations like massacres and torture, and a place where women are forced to beg because they are prevented from working. But she also found that the first voices of protest come from the most repressed, including an opposition group that uses hidden cameras to film the executions. Saira Shah's journey into the heart of Afghanistan reveals a country of desperate poverty, much of it brought about by the deliberate policies of its fundamentalist Islamic government, the Taliban. Women are deprived not only of education, medicine and freedom, but often of the very means of survival.Saira, the daughter of Afghan scholar Idries Shah, took a dangerous journey into the heart of her father's country. Starting in the vast refugee camps of Pakistan, she made her way into Afghanistan itself, where she found unimaginable brutality but also extraordinary bravery. Read the full story "Beneath the Veil"